PT Industri Kapal Indonesia (Persero) - PT IKI or most commonly known as IKI Shipyard is a reputable state-owned company in Indonesia, based in Makassar South East Sulawesi and running business in shipyard industry. IKI Shipyard engaged in shipbuilding, docking and related industry. 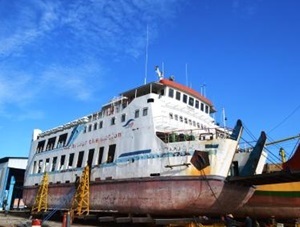 According to information found in IKI Shipyard's company profile as cited by JobsCDC.com, IKI Shipyard was first established as Proyek Galangan Kapal Makassar or Makassar Shipyard Projects in 1963. PT Industri Kapal Indonesia (Persero) officially established in 1977. PT Industri Kapal Indonesia (Persero) is fully-owned by the Government of Indonesia which represented by the Minister of State-Owned Enterprises (SOE). Its head office is registered at Jl Galangan Kapal No 31 Makassar 90211. IKI Shipyard now has 2 yard facilities; Makassar Yard and Bitung Yard. IKI Shipyard also supported by 1 representative office Jakarta and 1 Business and trade units Makassar. Maximum age of 35 years old (S1/D4) on 2018. Education background in Bachelor Degree or equivalent (S1/D4) with minimum GPA of 2.75 (PTN) and 3,00 (PTS), majoring in following disciplines. Minimum 3 years of experience in the field of accounting. Skilled in operating Microsoft Office and Accounting Program. Able to compile journals, income statements and balance sheet financial statements. S1 Shipping Engineering (Shipping Design, Shipping and Transportation System). Minimum 2 years of experience in the field of engineering/planner. Skilled in operating AutoCAD, Maxurf, and MS Project. Minimum 2 years of experience in the field of shipyard marketing. Strong communication, leadership and negotiation skills. Willing to be placed in Head Office Makassar and Bitung Unit. Especially for Marketing Jakarta ares must be domiciled in Jakarta. Honest, conscientious, have data analysis skills and able to work together in teams, and have high integrity. Fluent in English, both oral and written as evidenced by TOEFL certificate. JobsCDC.com now available on android device. Download now on Google Play here. Please be aware of recruitment fraud. The entire stage of this selection process is free of charge. PT Industri Kapal Indonesia (Persero) - Accounting, Engineer, Planner, Marketing IKI Shipyard November 2018 will never ask for fees or upfront payments for any purposes during the recruitment process such as transportation and accommodation.